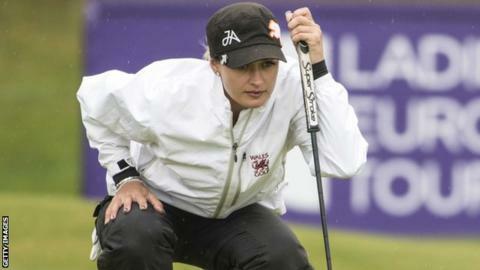 Amy Boulden is confident that she can mix it with the world's elite in the 39th British Women's Open at Turnberry. The Welsh golfer, 22, will compete with the world's top 20 ranked players. While this may only be her second year on the Ladies European Tour, Boulden is eager to play in a field which includes 23 Major winners. "I'm in the event, I'm playing well, so I'm not going to say I can't win the event. It would be negative to think that," said the Llandudno native. "This week I definitely feel more comfortable, I feel like I do belong here... more so than in previous years. "I've had a good practice over the last few days so I'm excited. "It is a bit serious playing alongside the best golfers in the world, but I don't feel outside my comfort zone this week which is a good thing. I don't feel intimidated, I feel at home." In her last event before arriving at Turnberry Boulden finished eighth in the Scottish Open and hopes to build on the form she found at Troon. "I know my game is in great shape. I'm really excited to get started and hoping to have a great week. Its a fantastic place which you've just got to plot your way around," Boulden said. "My game plan this week is to not go into any of the bunkers, the key is definitely to stay patient and stay out of the bunkers - you don't want to be dropping shots that way." Boulden will begin her first round alongside Yumiko Toshida of Japan and Holly Clyburn of England, teeing off at 12:21 BST on Thursday, 30 July. As at most Open venues the weather will pose as equal a test as the course and with wet, windy conditions expected, Boulden knows she will have to tailor her game to suit the links course. "I've grown up on links golf so I hit the ball very low, which will go in my favour," she said. "I've heard its bad Friday afternoon, so because I've got a morning tee time that could go in my favour. "In every British Open I've played so far I've had the worst of the draw, so I'm hoping I'm a bit lucky this week."